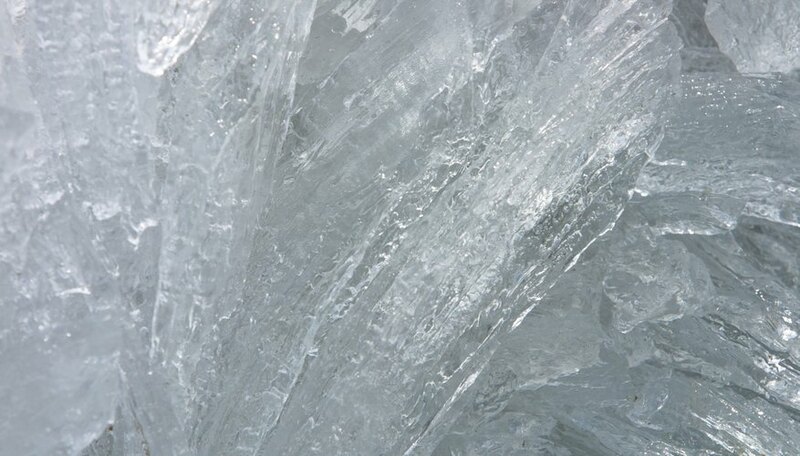 What Substances Make Ice Melt Slower? Although it's not exactly Mothra vs. Godzilla, the folks at Jefferson Lab -- in a segment for their YouTube series "Frostbite Theater" -- put dry ice and liquid nitrogen in the same container to see what would happen. Both materials are extremely cold and far below zero, but the temperature difference makes this an interesting experiment. Setting up a dry ice vs liquid nitrogen experiment also causes a twist in the way we think about terms such as cold, hot and boiling. Dry ice vs liquid nitrogen is an interesting topic to investigate the properties of what we think of as hot, cold and boiling. At temperatures far below zero, dry ice and the much colder liquid nitrogen create interesting effects. It's fun to watch the experiment, but here's a spoiler alert: With dry ice temperature being about -110°F and also being denser, it sinks to the bottom of the container. The liquid nitrogen temperature, which starts at about -321°F, begins to increase rapidly, causing it to boil. Who knew dry ice was so hot? Well, in science, everything's relative. Dry ice is solidified carbon dioxide gas. Because of this, the dry ice chemical formula is the same as carbon dioxide, or CO2. Carbon dioxide is a colorless, odorless gas. When that gas is frozen, it becomes what we call dry ice. When regular ice melts, it turns into a liquid. 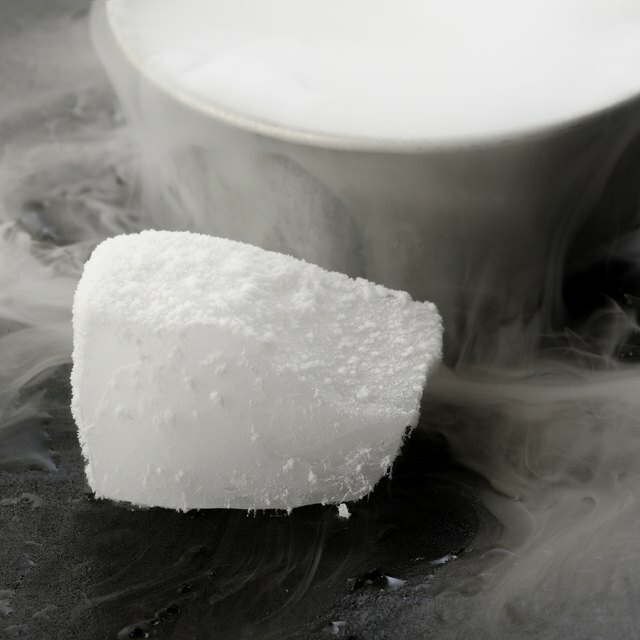 When "dry" ice melts it sublimates at room temperature -- meaning that it goes directly from a solid to a gas. These characteristics make dry ice valuable for keeping food cold without refrigeration, and for creating spooky foggy effects at Halloween. Beyond the ice cream cart and your punch bowl, however, dry ice is widely available and has many commercial uses. Medical facilities use it to keep specimens cold. Certain industries use dry ice -- in a method called "dry ice blasting," similar to sand blasting -- to clean equipment. For example, it is used in the oil fields to remove the sludge from the bottom of oil tanks. According to DryIceInfo.com, the commercial uses of dry ice range from cattle branding to meat processing to floor tile removal to gopher eradication. It's versatile stuff. The general public can buy dry ice in many grocery stores for a couple of dollars per pound. Bring your own cooler with you when you want to make the purchase and just tell them how many pounds you want. Nitrogen is a gas. To make it a liquid, it has to be cooled quite extensively. At typical liquid nitrogen temperature of -346°F, it looks like boiling water, even though it's extremely cold. When it is frozen below -346°, it becomes a solid. When taken above its boiling point of -320.44°F, it becomes a gas. As the folks at Jefferson Lab demonstrated, liquid nitrogen is much colder than dry ice. This makes it more dangerous to handle and therefore less available to the general public. Although some bars make cocktails with liquid nitrogen, in October 2012 this fad resulted in a teenager in the UK having emergency surgery to remove her stomach after she drank one. The bar quickly removed such drinks from its menu. Liquid nitrogen, handled safely, can be great fun in chemistry class. The Cornell University website lists many oddball uses for the stuff, including pouring about a cup of liquid nitrogen into a quart of bubble solution -- "Bubbles go everywhere!" -- and freezing a banana in liquid nitrogen and using it to hammer a nail. Silly, right? But these tricks reveal two of liquid nitrogen's most valuable properties: it expands quickly and freezes objects immediately. The controversial process known as "fracking" takes advantage of liquid nitrogen's rapid expansion to fracture rock formations that contain natural gas. And liquid nitrogen's rapid and thorough cooling is put to use in many medical applications, for example in freezing -- and immediately destroying -- unwanted tissue, such as warts and small cancers. Summers, Vincent. "Dry Ice Vs. Liquid Nitrogen." Sciencing, https://sciencing.com/dry-ice-vs-liquid-nitrogen-6149385.html. 12 October 2018.